The last 24 hours have really being packing paranormal drama,at least from my point of view. In the night one of my ballet pointe shoes fell clean off the windowsill and I found it dragged into the corridor next to my room in the morning, as if that wasn't enough after the falling of the shoe my Mom felt something come sit on her that felt like a cold breeze. Go figure. 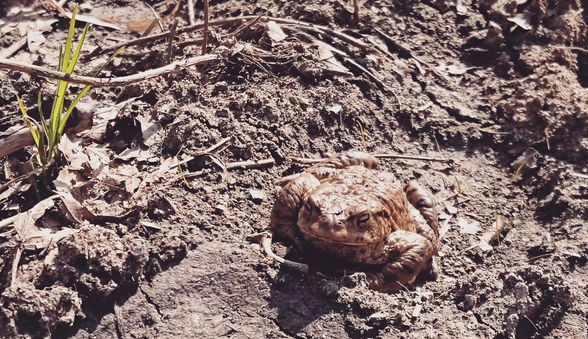 So, the following morning my Mom and I venture for a work to a newly opened supermarket close by (which turned out to be totally awesome) when I met a frog along the way, sitting in the mud, chilling in the sun. It's been ages since I've seen wildlife around my family home since the place got blitzed with RoundUp that seemed to kill off the local ecosystem almost completely. So finding such a wonderful happy from ribbiting in the sun was kind of special. Its some how the way looking terrifying and yes its interesting article.Those who live to read drama and scary stories they should must check this post.Thank you.